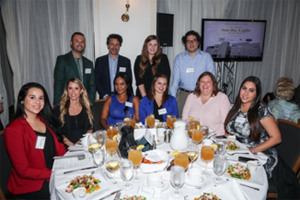 For the more than 250 community leaders who attended the annual "See the Light" luncheon on October 25th, the focus was on how Miami Lighthouse has transformed the lives of the blind and visually impaired in our community since 1931. The theme of excellence in vision rehabilitation was demonstrated by the speakers and musicians on the program which began with "You Raise Me Up" by vocalist Arantza Espinosa, Miami Lighthouse student and winner of Melodias del Alma, the first International Blind Singing Competition and The Children's Trust Young Talent Big Dreams 2012 competition. They keynote address was given by Joseph Chica, former Miami Lighthouse program participant and current student at the University of Miami who was accompanied by his guide dog Gunner. Joseph told the luncheon guests how his family enrolled him in the Miami Lighthouse Early Intervention Program at age three. 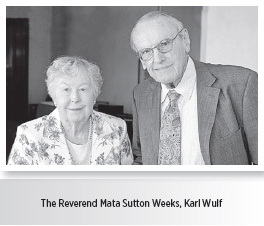 He continued to receive vision rehabilitation training throughout his school years, learning how to use a white cane and participating in orientation and mobility training which was a prerequisite for his getting a guide dog. 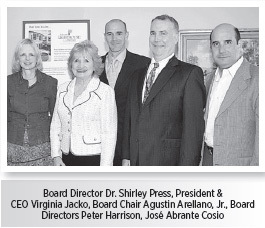 In her remarks CEO Jacko expressed gratitude for the vision rehabilitation training she received at Miami Lighthouse that enabled her to fully utilize her executive skills after becoming blind and to lead the organization dedicated to helping others learn how to excel despite vision loss and to lead confident, independent and productive lives. 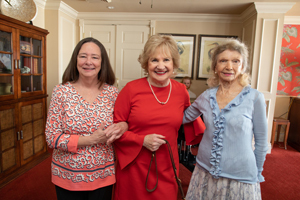 Attendees viewed a video underwritten by event sponsor Northern Trust entitled "It's Possible to See without Sight™" which showcased the comprehensive scope of the transformational vision rehabilitation and eye care programs offered by Miami Lighthouse. Miami Lighthouse serves 35 times as many program participants as it did in 2004, now providing life-changing vision rehabilitation and eye care to more than 17,000 individuals annually. 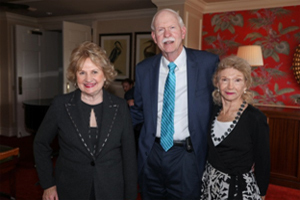 To help meet this extraordinary increase, luncheon guests were apprised of the opportunity to participate in two dollar for dollar challenges to help Miami Lighthouse empower visually impaired program participants. 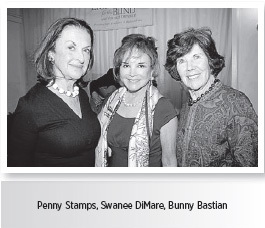 The new four-year Wildflower $1 million matching challenge will support visually impaired participants in the Music and Tactile Art Programs, and the Spencer challenge of up to $500,000 a year to sustain programs for blind early learners in the Miami Lighthouse Learning Center for Children™ continues for the next three years. 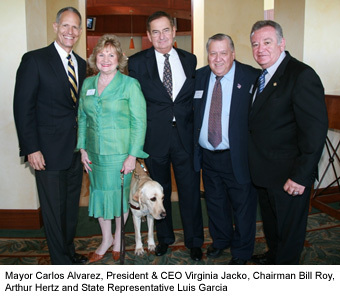 For information on how you can support services for the blind and visually impaired in our community call CEO Virginia Jacko at 305-856-4176. The program concluded with a spirited rendition of "We Are Family" performed by the visually impaired program participants of the Miami Lighthouse United Voices Choir. 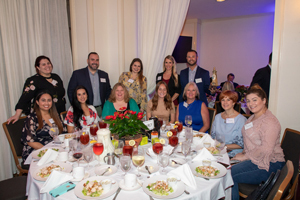 Sponsors of the See the Light luncheon included Northern Trust, The Art of Shaving, Norma Jean Abraham, an anonymous donor, Monster Sound Productions, Rimland's Nursery and El Carajo. 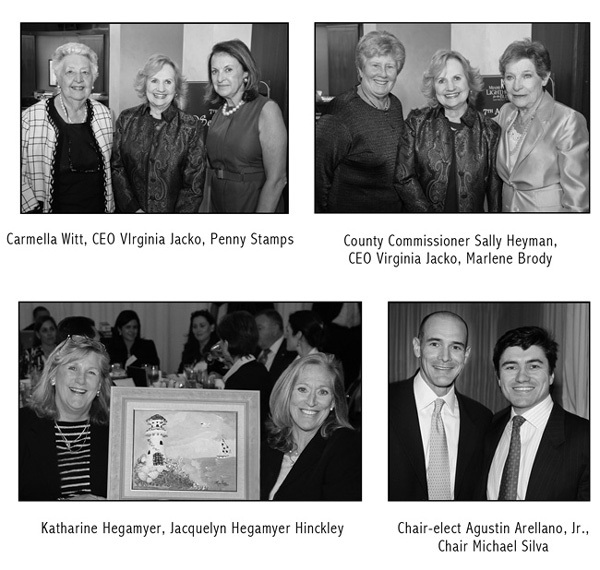 For the 200 community leaders attending our 2017 See the Light Luncheon, the focus was on the opportunity to raise funds necessary to sustain programs that improve the lives of children through our new innovative Learning Center for early learners. 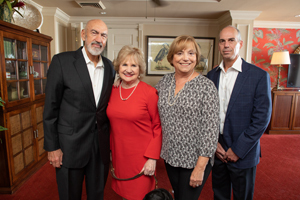 On October 12, the See the Light Luncheon filled the ballroom at the Riviera Country Club in Coral Gables with enthusiastic supporters who learned about the capabilities of the blind from various perspectives. 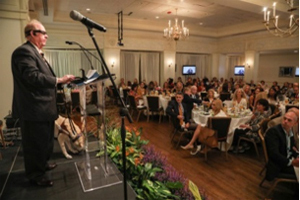 Keynote speaker and best-selling author and survivor of the World Trade Center disaster Michael Hingson urged the audience to stand up for the rights of the visually impaired and empower them to achieve their full potential. He noted that the unemployment rate among the blind currently stands at 70 percent, even though a clear majority of that population is able to join the workforce. 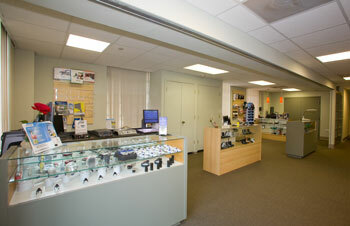 "It's not that blind people can't do the jobs," Mr. Hingson said. "It's other people who don't believe that blind people can do the job." 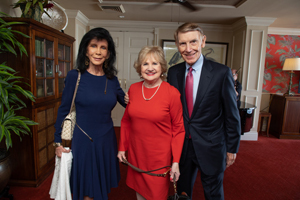 Later in the luncheon, philanthropist Mary M. Spencer announced that she has established a new challenge grant, which will match dollar for dollar private contributions to Miami Lighthouse during the next four years to a maximum of $2 million. 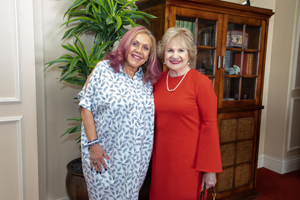 She explained that the challenge is intended to motivate others to support the Miami Lighthouse Learning Center for Children™ to create the type of opportunity for today's blind children that Mr. Hingson advocates. Sponsors of our See the Light Luncheon included The Art of Shaving, JM Private Insurance, GenSpring Family Offices and Serendip-A-Tea. The Wildflower Foundation, offered a one-for-one matching challenge to donors of $150,000 to be raised by the end of 2016, the first year of a four-year matching challenge. Funds raised will be used for critical program support. 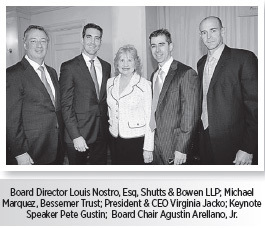 Generously underwritten by Nostro Jones, P.A., GenSpring Family Offices and the Anthony R. Abraham Foundation, the event was attended by nearly 300 community leaders at the Riviera Country Club. NBC-Channel 6’s John Morales emceed the event that began with a performance by Miami Lighthouse Music Program student Danays Bautista who sang “Amazing Grace.” The keynote speaker was Paul Schroeder, Consultant & Past Vice President of the American Foundation for the Blind, who has been totally blind since early childhood. Mr. Schroeder spoke about the important role of the Miami Lighthouse in the lives of the blind and visually impaired. Guests viewed a video produced by Multivision that features Miami Lighthouse clients participating in various programs. 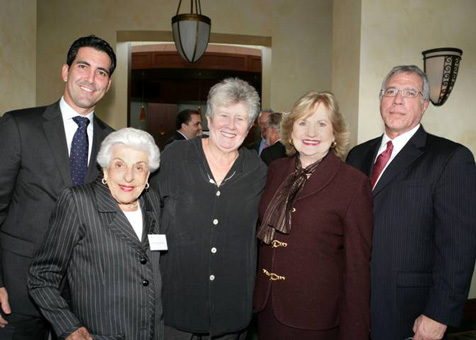 Miami Lighthouse marked the start of its 85th year serving the blind and visually impaired with CEO Virginia Jacko announcing at its annual See the Light luncheon that the Braman Family Foundation has pledged a $1 million leadership gift toward the expansion of its Center of Excellence to create a new facility, the Lighthouse Learning Center for Visually Impaired Children, which will be matched by an anonymous donor. The much needed new Center will serve as a pre-kindergarten for blind three-and four-year olds, an early intervention center for children from birth to age three and provide a venue for learning laboratories and recreation. Keynote speaker Thomas J. Wlodkowski, Comcast Vice President for Accessibility, told the audience about Comcast’s collaboration with Miami Lighthouse to pilot the new Comcast Talking Guide. 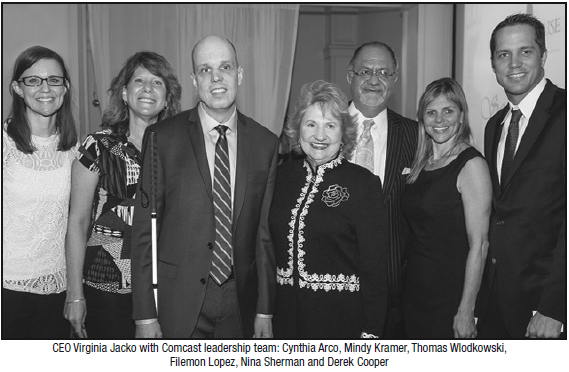 The Spanish language version of the Comcast Talking Guide was unveiled at the luncheon. The innovative new system allows a visually impaired person, using either English or Spanish, to access TV program selection through audio output. 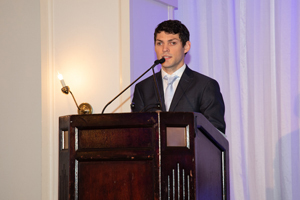 Emceed by Coral Gables Chamber President & CEO, Mark Trowbridge, the event was sponsored by Comcast, Nostro Jones P.A. 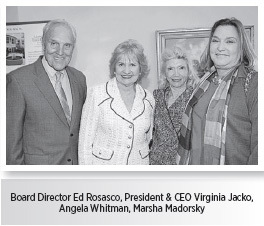 and GenSpring and was attended by more than 250 community leaders and philanthropists. 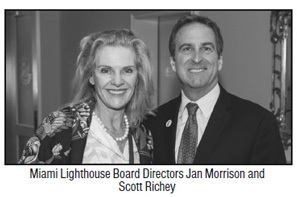 Hors d’oeuvres were provided by Norma Jean Abraham and Lighthouse logo cookies were provided by Jan Morrison. For information: Cameron Sisser, 786-362-7515, or visit www.miamilighthouse.org. 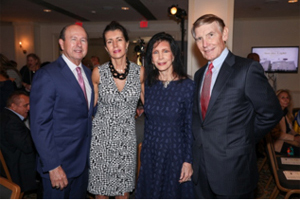 Hosted by Bessemer Trust, Shutts and Bowen LLP and the Miami Dolphins, more than 200 of South Florida’s philanthropists and community leaders attended the See the Light Luncheon at Riviera Country Club on November 14th. With the generosity of the Wildflower Foundation, a new incentive challenge was announced which will run through the end of 2014. Operating funds were raised to support programs, such as Braille literacy, computer and digital technology and math laboratory curriculum, to empower young children and teenagers with skills to be competitive and highly productive despite their blindness. Funds will also be used to support Miami Lighthouse’s nationally recognized Better Chance Music Production Program™ student vocalists and musicians. Miami Lighthouse’s Better Chance Music Production Program™ student vocalist Angel Wallace began the lunch by singing “God Bless the USA,” and Keynote Speaker Pete Gustin, who has overcome his visual impairment to become the voice over artist of the Miami Dolphins, spoke to attendees about programs and services Miami Lighthouse provides and how essential they are to the community. 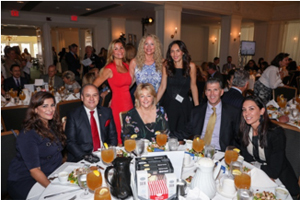 Supporters and sponsors of the lunch will enable Miami Lighthouse to educate more blind and visually impaired youth and empower them with the skills necessary to live successful, independent lives. According to CEO Jacko, these funds will help meet the demand of a nineteen-fold client increase since 2004; now serving 9,500 individuals annually. 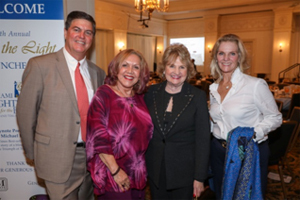 Hosted by Bessemer Trust, Shutts and Bowen LLP and Commissioner Sally Heyman, more than 200 South Florida community leaders attended the See the Light Luncheon at La Gorce Country Club on November 15th. 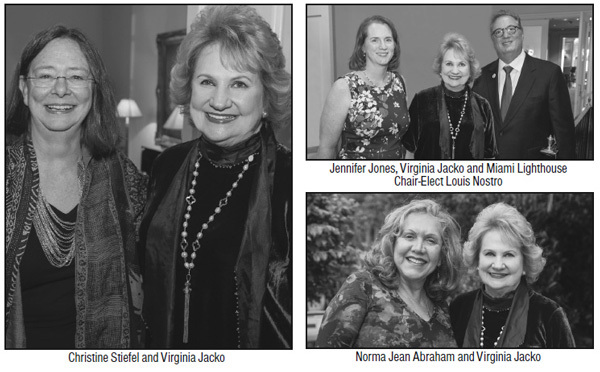 Major contributors to the capital campaign honored with ceramic plaques made by blind children and adults were The Reverend Marta Weeks, Jan and Dan Lewis, Penny and Roe Stamps, Jacquelyn Hegamyer Hinckley and Katharine Hegamyer. Ruby Jubilarians were also recognized. Operating funds were raised to support programs in the new facility, such as, Braille literacy, computer and digital technology and math laboratory curriculum, to empower students with skills to be competitive and productive despite their blindness. The new Fourth Floor Spencer Educational Empowerment Center will allow Miami Lighthouse to educate more blind and visually impaired youth. According to CEO Jacko this expansion will help meet the demand of a fourteen-fold increase since 2006; now serving 9,500 program participants annually. For more information call Cameron Sisser, 786-362-7515 or visit www.miamilighthouse.org. 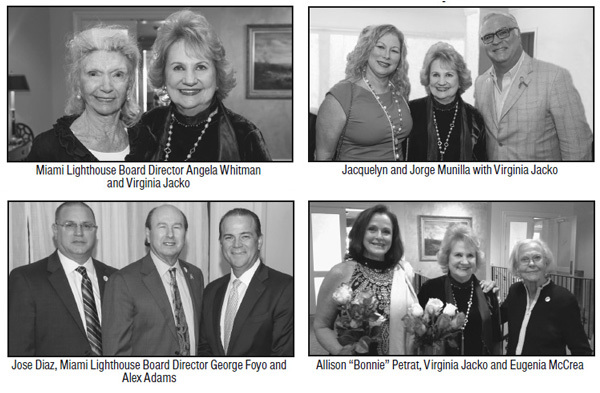 Miami Lighthouse held its sixth annual Share the Vision luncheon at La Gorce Country Club on October 6. 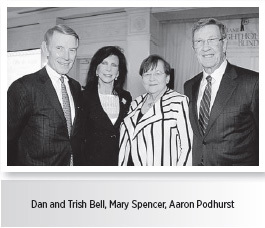 At this year's 2010 Share the Vision luncheon, the Educational Empowerment Challenge was announced, a $500,000 matching incentive to expand educational opportunities for our visually impaired students, our professional staff and for internships. This match will also be used to expand our year-round programming for children focusing on Braille and technology literacy and pre-Braille literacy training for our blind babies and their caregivers. 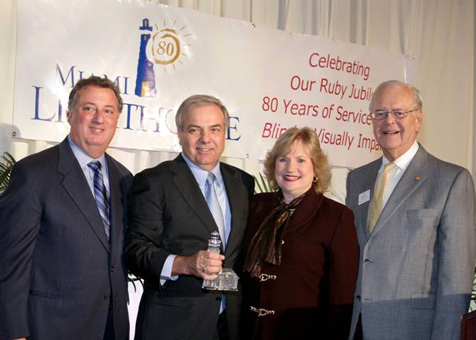 Owen S. Freed, Esq., Chairman of the Board, and Virginia Jacko, Miami Lighthouse President and CEO, presented a beautiful crystal lighthouse to Louis Nostro, Esq., Miami Lighthouse Board Director, and Joseph D. Bolton, Managing Partner, Shutts & Bowen, to honor the law firm for 80 years of dedication and pro bono service to Miami Lighthouse. In 1935, Colonel Shutts of the Miami Herald asked his young lawyer associate Preston Prevatt to provide pro bono service to incorporate Miami Lighthouse, a newly formed private agency serving the blind of Miami. 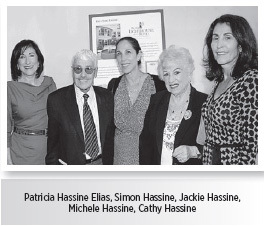 Since then, Shutts & Bowen has supported Miami Lighthouse through legal services and generous donations. Guests were treated to the musical talents of students who participate in our nationally recognized music inclusion program as they entered the venue. Miami Lighthouse summer camp children Jayden Ferrell and Silvio Plata, delighted the crowd with “Wheels on the Bus” and “Itsy Bitsy Spider,” while Joseph Chica gave a moving invocation. 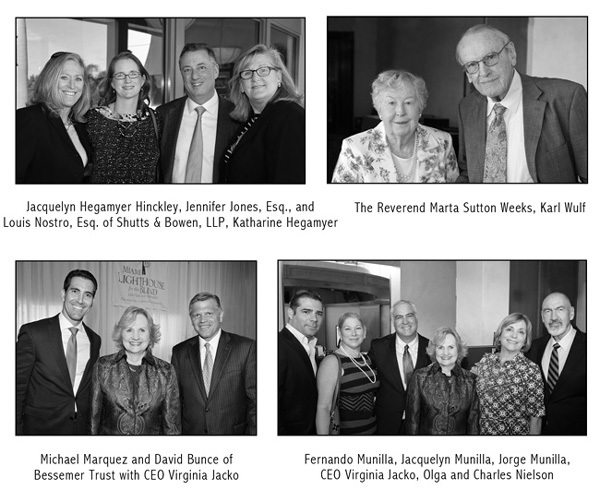 More than 200 of South Florida’s philanthropists and community leaders attended this extraordinary luncheon, generously underwritten by Bessemer Trust. Guests enjoyed wine provided by Gulf Wine Merchants and beautiful hand-made ceramic centerpieces created by Miami Lighthouse blind and visually impaired adults in the Social Group Activities program. Miami Lighthouse Board Director Ramón Casas challenged attendees to imagine what vision impairment is like, and spoke about the importance of the matching grant challenge. He praised the Educational Empowerment Challenge as an example of true philanthropy and pointed out the power of a matching gift, encouraging guests to participate in the challenge. Miami Lighthouse has received its third consecutive 4-star rating, the highest rating possible, from Charity Navigator in recognition of its ability to efficiently manage and grow its finances. The notification letter states: “Only 13% of the charities rated by Charity Navigator have received at least 3 consecutive 4-star evaluations, indicating that Miami Lighthouse for the Blind and Visually Impaired consistently executes its mission in a fiscally responsible way, and outperforms most other charities in America." 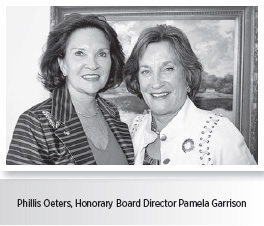 To view the full press release and the award letter from Charity Navigator click here. Miami Lighthouse is pleased to announce a way for new and existing donors to double the impact of their charitable giving: the One Million Dollar Challenge in Memory of Sash A. Spencer. Through this challenge all new donations or gifts of an increased amount from existing donors between $100 and $150,000 will be generously matched by Mary Spencer. 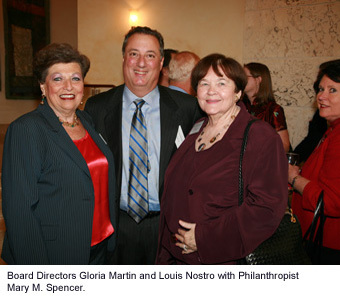 Over 250 of South Florida’s most generous philanthropists and community leaders were on hand to watch Miami Lighthouse for the Blind and Visually Impaired accept the first $250,000 installment of the “One Million Dollar Challenge in Memory of Sash A. Spencer,” an incentive matching gift from philanthropist Mary M. Spencer at the 4th Annual “Share the Vision” fundraising luncheon November 12 at La Gorce Country Club. Thanks to the generosity of Mrs. Spencer, all new donations or gifts of an increased amount from current or past donors between $100 and $150,000 will be matched in the memory of her beloved husband, Sash A. Spencer. 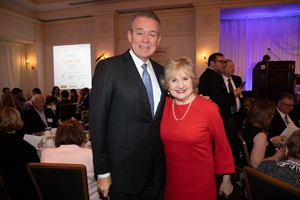 This year’s luncheon, generously underwritten by Bessemer Trust, raised $350,000 for programs and services offered to blind and visually impaired children and adults. 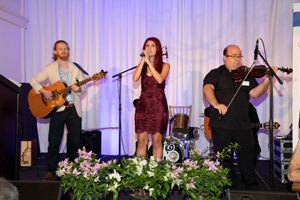 Guests enjoyed wine from The River Wines and beautiful table centerpieces designed by Epicure Events which incorporated hand-made ceramic pieces created by Miami Lighthouse blind and visually impaired children and adults.